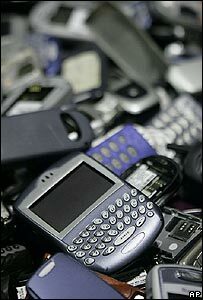 BBC NEWS | Science/Nature | Do mobile phones cost the Earth? Mobile phones may be one of our smaller electronic possessions, but the environmental issues surrounding them are proving to be a sizeable challenge. The sheer number of the devices sold around the globe is startling. David McQueen, principal analyst for handsets at Informa Telecoms and Media, says that an estimated 940-980 million phones will be sold this year. "Next year, if growth in the market continues at about the current rate, there will be more than a billion brand new handsets sold around the world - it is a massive market," he observes. "If you take these figures over the years since the late 80s, when phones first came on the market, there has got to be at least five billion handsets in existence." Dylan Gwynn Jones, of University of Wales, Aberystwyth, oversaw some preliminary research into the environmental impacts from mobile phones. "The findings were that the ecological footprint of creating a mobile phone may be small, but the cumulative effect is quite significant on a global scale," he told BBC News. As with all electronic equipment, mobile phones contain a range of substances that are harmful if the devices are not disposed of properly. Heavy metals such as mercury, lead and cadmium are present within mobile phones, especially older models, as well as brominated flame retardants in the devices' printed circuit boards and casings. These substances have been linked to cancers and other disorders in humans, and can have a devastating impact if they are released into the environment. Problems begin if the handsets end up in landfill sites or if they are dumped illegally because this could lead to toxic substances seeping into the soil and groundwater. The UN Environment Programme (Unep) estimates that up to 50 million tonnes of waste from discarded electronic goods is generated annually, with the majority being shipped from the West to developing nations. Traditionally, much of the waste found its way to Asian countries such as China and India, but tighter regulations means more and more is ending up in Africa where there are few facilities to safely deal with it. The issue was the main focus of a recent conference on the UN Basel Convention, designed to regulate international trade in toxic waste. Although mobile phones only make up a small percentage of the e-waste mountain, manufacturers are aware of the need to address the issue. Leading makers, including Motorola, LG, Sony Ericsson and Philips, have all implemented eco-design aspects into their production lines, including reducing the amount of hazardous substances used in their products. Nokia, the world's largest mobile phone manufacturer, produces a handset every nine seconds. It has decided to implement requirements set out in the EU Restriction of Hazardous Substances (RoHS) Directive in all 10 of its factories around the globe. The RoHS Directive bans six substances (lead, cadmium, mercury, hexavalent chromium, PBB and PDBE) from products that are either made or sold in the EU. "We have models that sell well in China or Brazil that still meet the most stringent criteria set up in the EU," says Markus Terho, Nokia's environmental affairs director. "It gives us flexibility; if there is a product that sells well in Brazil and we think that it would sell well in Europe, we can start selling it in Europe. "We also felt that when we saw the pieces of regulation from the EU it was quite clear that some of the other major markets would follow, so it was easier for us to implement it globally," he told BBC News. Another EU law that is being rolled out across the 25-nation bloc is the Waste Electrical and Electronic Equipment (WEEE) Directive. It requires producers to bear the cost of the collection, recovery and disposal of the so-called "e-waste" arising from their products. The aim is to make manufacturers design devices with fewer impacts on the environment. NEC says it has developed the first handset that uses plant-derived bioplastics. 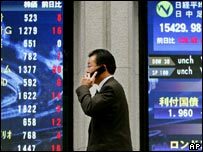 The Japanese electronics firm says the phone's manufacturing process also emits 50% less carbon dioxide (CO2) than conventional approaches because of a shift away from fossil fuel-based power generation. The technological evolution of the mobile handset since it first emerged on the market has led to a reduction in both materials and energy consumption, says Markus Terho. "The first mobile phone weighed almost a kilogram, like a brick, and you could talk for about 15 minutes," he recalls. "Now, we have devices that are under 100g and you can talk for eight or nine hours, while standby time is weeks," he adds. While the energy performance of phones has increased dramatically, the sheer number of phones has led to another problem - chargers being left plugged in sockets when not in use. Nokia chargers are still drawing about 0.1-0.5 watts when a phone is not connected, Mr Terho says. Although, individually, this appears to be a drop in the ocean, he admits that when there are millions of chargers being left plugged in the wall each day, it does become a big issue. "From next year, when fully charged, the phones will no longer just say it is charged, it will say 'please unplug the charger'," he reveals. Mr Terho says that early Nokia phones consumed tens of watts of power to make a call, whereas today's devices are using about one watt, allowing mobiles to be more than just phones. "If the energy efficiency of the device is much higher, then you can do so much more than just talk. You can send e-mail, send texts, listen to music, take pictures and so forth." The preliminary research carried out by the University of Wales, Aberystwyth, seemed to confirm that there was an appetite for an ever increasing number of phone-based gadgets. The study, commissioned by the UK's Department for Environment, Food and Rural Affairs (Defra), found that about 90% of the people questioned said that they did or would use a camera on a mobile, and 60% would use its MP3 player. However, the rush to get new technology on to shops' shelves does have an impact. In 2001, some gains made in energy efficiency were lost. "The reason for this is that it was the first year we were introducing 3G (third generation) phones," explains Mr Terho. "The first 3G models were not as efficient as the previous GSM ones." But, he added, the new technology had merged numerous functions into one phone, meaning that less energy and raw materials were consumed by manufacturers. "Convergence is a good thing from an environmental point of view because you do not need to buy a separate camera or music player; you can have it all in one device." But analyst David McQueen suggests that these developments are used by manufacturers to keep people wanting brand new phones, adding to the e-waste cycle. "That is what the vendors want; they want to create this market to stimulate demand for new handsets through developments in design, features and functionality," he told BBC News. "I don't think there is any other consumer electronic device that is generally replaced every 12 months."